To quote The Allman Brothers Band, “sometimes I feel like I’m tied to the whipping post”. I look forward to Saturdays. Especially when I can spend the whole day in the shop. Today was supposed to be one of those glorious days. But it didn’t quite work out that way. I started the day by doing some light cleanup on the rear frame assembly that was glued-up a couple of days ago. I trimmed and flush planed the wedged tenons. Then flushed the post faces to the rail faces. They were pretty close to start with but offset just enough to feel with my finger. I do this now because it’s much easier working on just the frame as opposed to the assembled carcass. Once that was done, set my plane down and went to move the frame assembly from the bench to the floor. I don’t know how, but this is where the day took a turn for the worse. I’m not sure but that may be a tear drop on the vice chop. I somehow managed to knock my #4 plane to the floor, tote first. You guessed it. The tote broke into two pieces. So after the initial shock passed and the sick feeling in my stomach subsided, I set out to repair the damage. Luckily the break was clean. I simply added glue and clamped the tote to dry. I moved on to cutting the tenons on the side rails. The side rails were cut to length earlier this week so it was just a matter of marking out the tenons and cutting the joints. 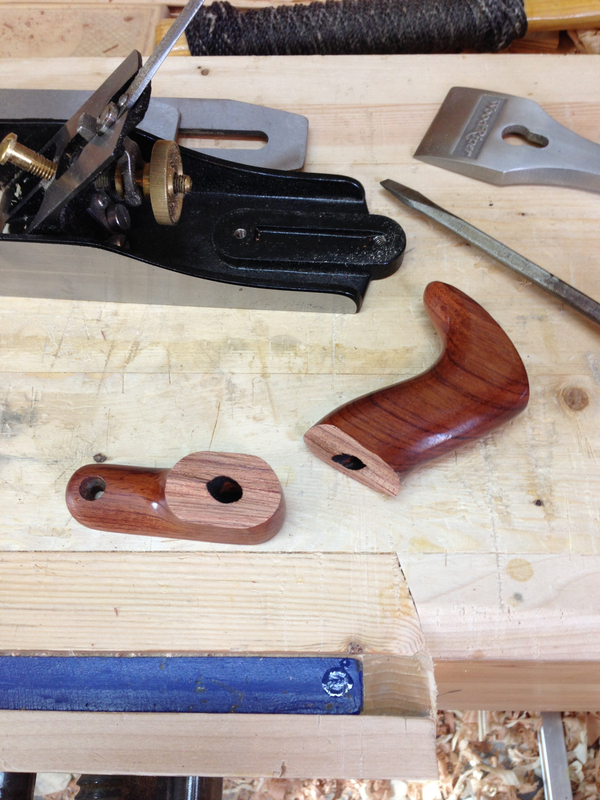 As I was fitting the first tenon it caught on the lip of the mortise and split out a large, shallow piece of rail. It looked ugly but glued back in place nicely. I managed to cut and fit three additional tenons without incident. So I turned my attention to plowing the grooves in the two rails that I had just fitted. The first three grooves went just fine. On the fourth groove I must have twisted the plane at the end of the stroke because I split off the outside corner of the groove. I glued that piece back in place and thru in the towel. Almost. Not too bad of a repair and it should perform just fine. I still had to finish the tote repair. A little file work, a little sanding and two coats of shellac. Good as used and ready to work. With that small success, I quickly locked the door to the shop and left before I destroyed anything else. This entry was posted in Plane Tote Repair. Bookmark the permalink. Those kind of days happen once in a while. The biggest challenge is to keep up the spirits despite messing up something. The broken tote do look like it glued up nicely, so that is a comfort. I hope you will have a fine Sunday without any unfortunate incidents in the workshop. You’re a trooper Greg. I have a 2 hiccup rule in my shop. Once I reach that limit I leave or work or something else. I should have quit when the plane fell. Luckily all was fixable, so no lasting damage. After the plane fell I was out of the zone. In hindsight, I don’t think I was ever in the zone and should have stayed out of the shop in the first place. Wow, I know the feeling. I dropped my LN #4 and broke the front knob and bent the screw last year, and recently dropped my LN tenon saw and snapped the handle on that. And I certainly know the feeling where it feels like I should have stopped before I walked in the shop. No one is immune to these types of days. Here’s to hoping that they are few and far between for everyone. 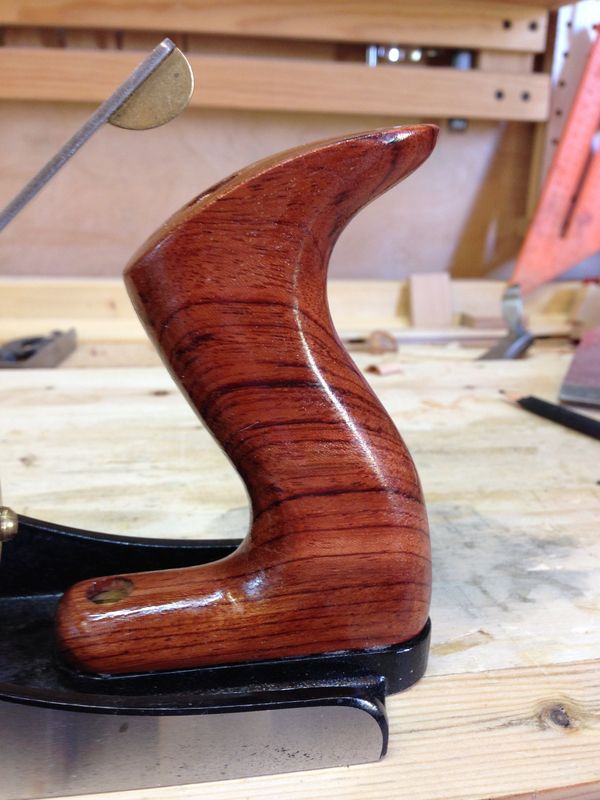 My #4 is my prized hand plane. I am sure a serious cussing would ensue if mine fell to my shop’s concrete floor. Your repair looks great. Trust me, I dug up the language from my Navy days for sure. But the tote repaired pretty well and it could have been much worse.